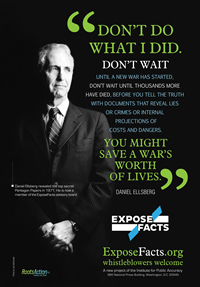 With your help, billboards will soon be reaching thousands of employees at places like the NSA, Pentagon and CIA every day, encouraging them to become whistleblowers. If you prefer, you can donate with your credit card through PayPal. If you are not a resident of the USA or Canada, please choose "Other" at the bottom of the State/Province list if that option is available on your screen.